Spring is full of amazing crafts and projects. I especially love DIY Spring centerpieces as they breath in a fresh and uplifting attidute into our home decor. Every year we brainstorm fun and different Peeps Centerpiece ideas for our home or for an event we are attending. This year, my kids chose to recycle a few things out of our craft box. 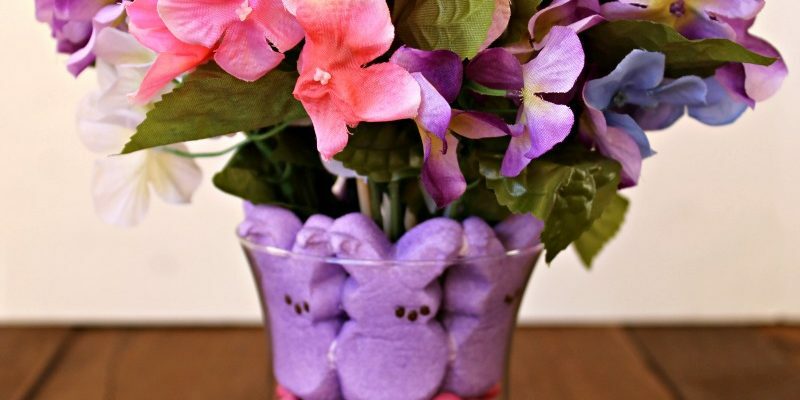 By selecting florals with bright colors, glass vase and a few chop sticks out of the home DIY tools, we just grabbed a few boxes of Peeps and M n’ M’s in the store. Our Dad is exceptionally impartial to PEEPS. With Easter onset, he is always on the lookout for a Peeps treat. That is why we buy him Peeps every Easter season. Guess what’s his favorite? The Chocolate Covered Peeps! If you love Peeps and make a ton of recipes and craft projects with this cool candy, then check out some of the least-known facts about Peeps. You’ll be even more fascinated by this “old as time” sweet dessert. To give you an idea how much Peeps production has changed in the past decades is how quickly they can print the eyes on each Peeps chick. Before it was all hand-painted, and it’s not hard to figure out what is the max a person can physically draw eyes on a Peeps candy! Now, the machine does about 3,500 eyes per minute! Without much ado, let’s become part of the Americans who will consume more than 600 Million Peeps Chicks and Bunnies this Easter Season. Why I particularly love this Easter peeps centerpiece project is that it calls only for a few things that are readily available in my craft closet or in the kitchen. Get a few boxes of bunny peeps, locate a transparent glass vase, and dig out old or new chopsticks. Plus select the silk florals for your one-of-a-kind home decor piece. Enjoy your marshmallow peeps while getting this fun peeps centerpiece built! Reuse & Recycle Your Craft Ingredients! I have a bunch of silk flowers that I use and recycle for every season. Be it Easter or 4th of July, I always have floral bunches in my craft box. I use colorful candy to fill up the vase and create a foundation for the flowers. Easter is so rich in its traditional pastel colors! The stores sell a ton of candy in every Easter color there’s out there. I use M n’ M’s for this DIY Spring centerpiece. Feel free to substitute for any candy. 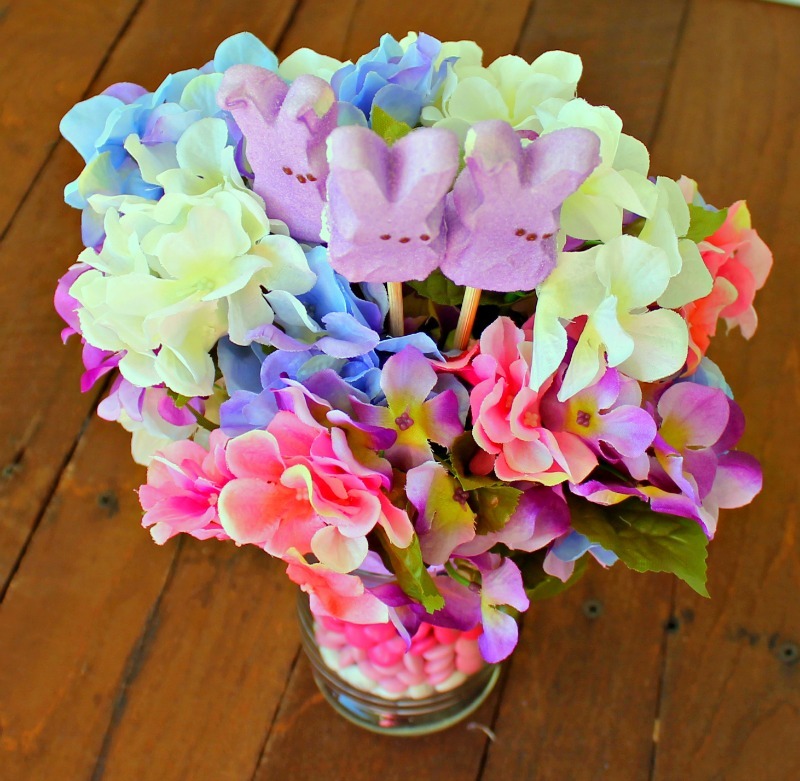 If you have the candy that is in colorful paper – use it for your adorable vase bouquet. Add more Peeps to the arrangement. Make your bunny peeps look out from the sides of the floral bouquet. 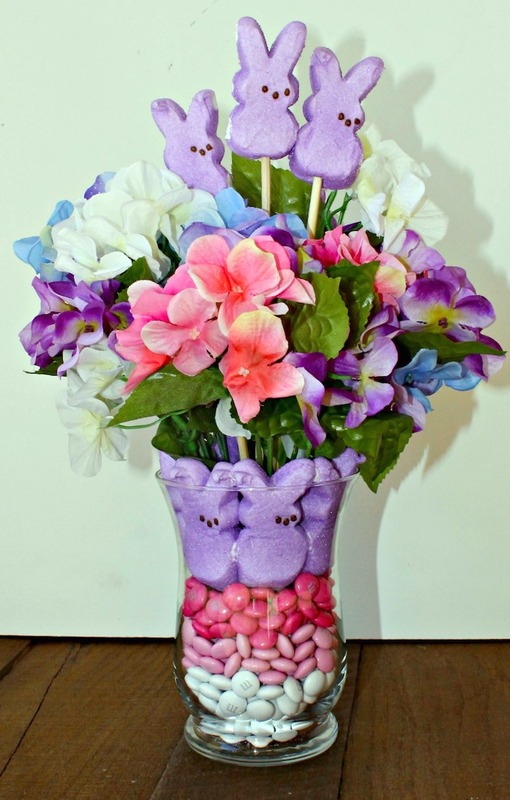 Or you could be creative and attach a few peeps to the walls of the vase. Whatever you do, use your imagination and your home environment to match to this fun peeps centerpiece. There’s no wrong doing in this craft. Here’s what we’ve got in our Easter bunny peeps centerpiece! I actually move this vase from the kitchen counter to the dinner table. A pretty Easter centerpiece in purple and lavender brings the warmth of Spring into our home. This is a great idea! I love how simple yet creative home decor this is. I’d love to do this! The peep and m&m centerpiece is so cute! It is so creative and fun. I can’t wait to make one. wow! This centerpiece is so cute! I would like to have it for Easter! This is such a cute DIY! 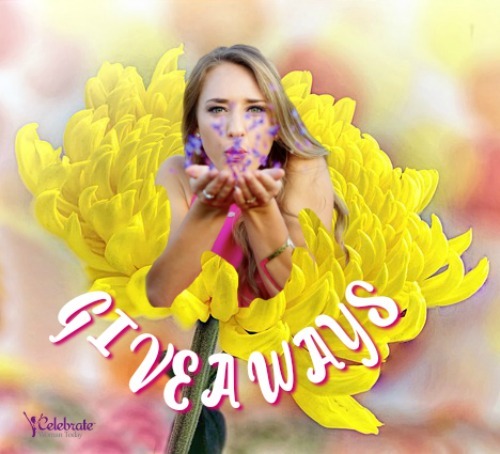 It would make a nice gift too for Easter hostesses! This is genius and it turned out beautiful! What a fun DIY to do with the kids for Easter! This centerpiece is so cute! Though, I love anything with PEEPS! Lol! 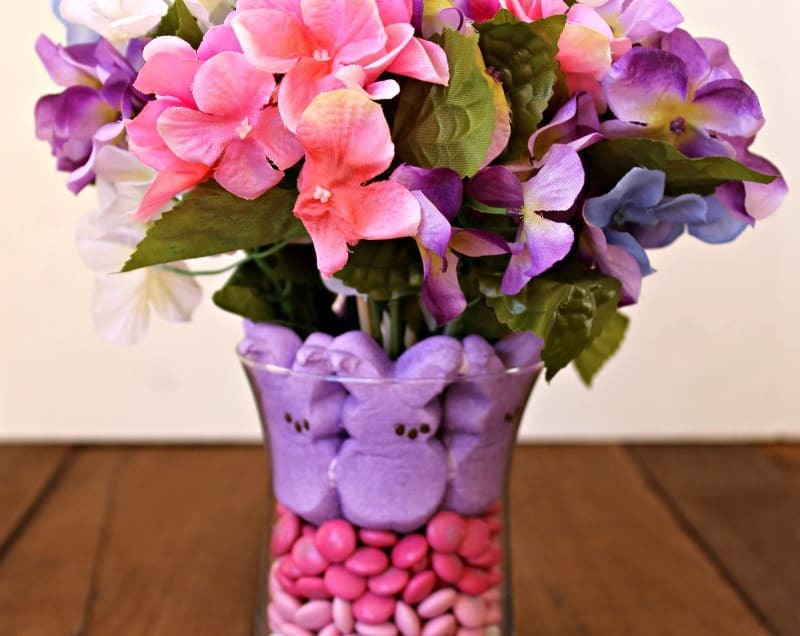 Not only are the Peeps cute, but I love the pinks and purples you chose for the arrangement! This is such a fun centerpiece!! I love how cute it is – perfect for spring! Love the colors! Lovely centerpiece for Easter! I am saving this and trying my hand at making it too for our Easter lunch with the family. Thank you for the idea. It is awesome! 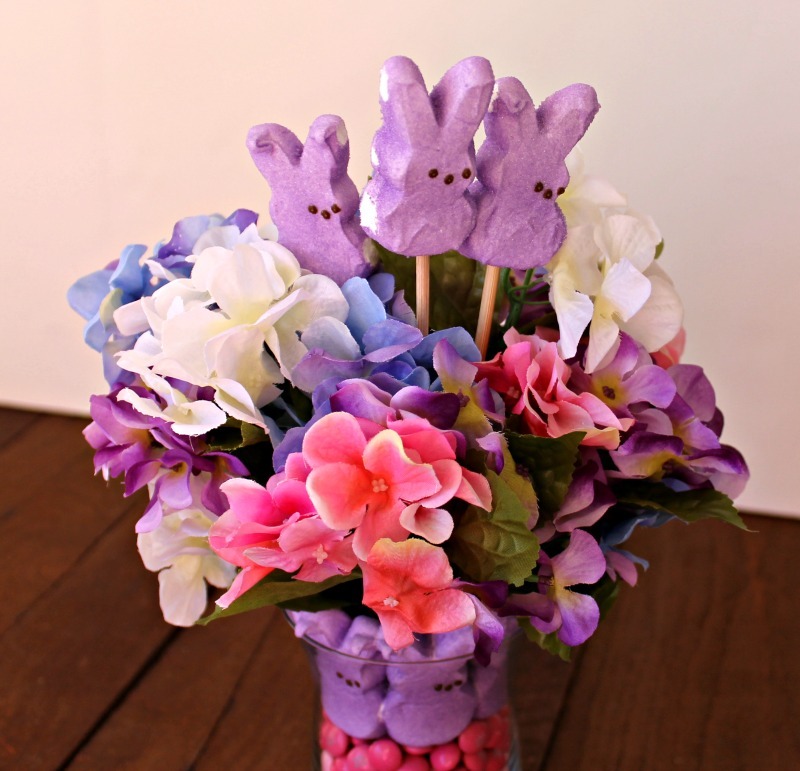 Craft an easy Easter table centerpiece that really makes a statement by surrounding a small vase of flowers with a larger vase filled with Peep Chicks or Bunnies. OMG. These are adorable. Love the idea and going to try it this easter. How sweet! This could be used for any color combination or scheme. An inventive idea for certain. That is definitely a cute centerpiece. I will be eating the M n’ M’s one by one every time I sit near the centerpiece. I love that brand of candy. I love them, very creative! Whose ready for easter? What an adorable idea for Easter decor! My sister uses spring colored gum balls. I love this center piece. I will have to get the supplies I need to make one for this Easter. That is just adorable! I am pretty sure my kids would be eating this and it wouldn’t last too long lol. You had me at the Easter candy. I love peeps and pastel M&M they are my favorites. The arrangement is beautiful. This is way too cute. I love peeps, but wouldn’t have thought to try and use them as decoration. Well isn’t this a creative idea! 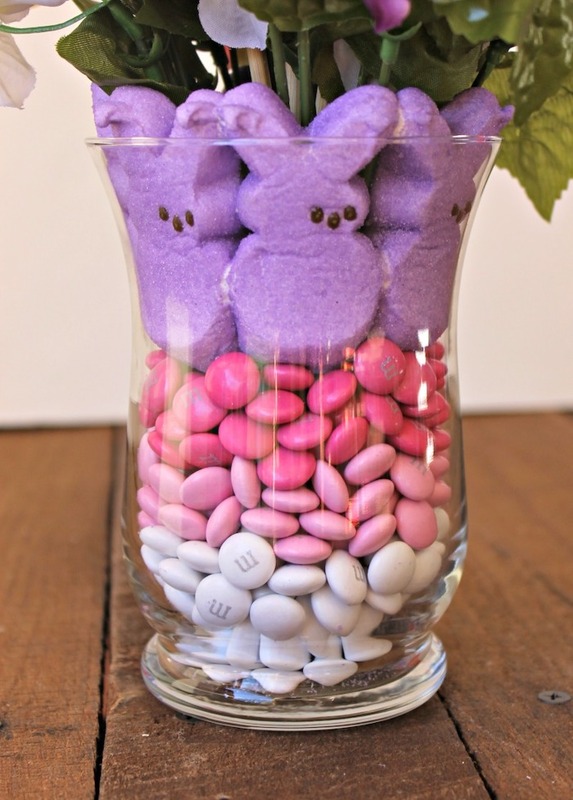 The peeps and M&Ms work perfectly for this center piece and add a nice pop of color. Okay, this is super cute. I love how colorful it is. I never would have thought of this on my own. 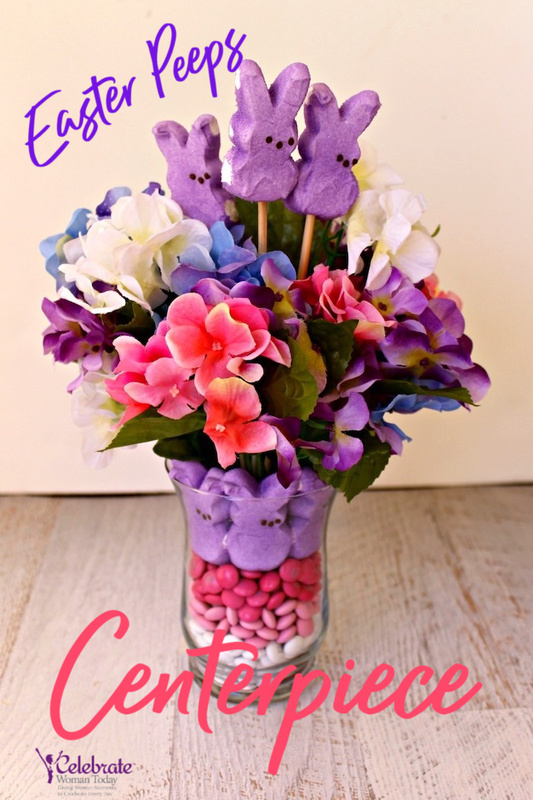 I love using Peeps as a vase filler for spring/Easter flowers. I’ve never thought to add Peeps in with the bouquet as well. How adorable! This is such a cute centerpiece for Easter. I don’t like the taste of Peeps but you can’t deny that they look fun! That is a cute way of incorporating peeps in your Easter decor! I’m not a fan of eating them, but I do think they’re cute. The decor looks adorable. Peeps peeping from every side. I loved the concept of reuse and recycle. A small step toward a better environment. We don’t like eating peeps way to much sugar for our taste. These are some great and fun ways to us those peeps. The colors are bright and so colorful.